ATLAS F1 Volume 7, Issue 1 by Ewan Tytler, U.S.A.
Former Cosworth Employees Mario Illien and Paul Morgan decided to set up their own "Cosworth" in January 1984 with the help and financial backing of Roger Penske. Since 1986, Ilmor have supplied engines for the Indy car series, the Championship Auto Racing Teams (CART) and the Indy Racing League (IRL). Ilmor entered Formula One when the 3.5 Litre Formula was introduced and the 1.5 Litre turbocharged engines were outlawed by the FIA. Ilmor's first Formula One engine was the 2175A, a V10 that was designed in 1989. Ilmor formed a partnership with Akira Akagi's Leyton House (which sponsored the March Team) in 1990 and the Ilmor 2175A engine made its Formula One debut at Phoenix in 1991, coupled with the Leyton House CG911 chassis. 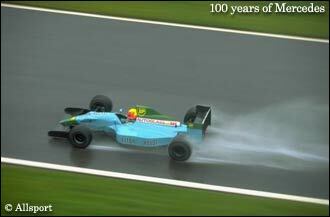 Ilmor's first and only point with Leyton House was won by Ivan Capelli at the Hungaroring in their 10th Grand Prix. 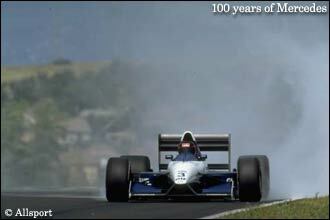 In 1992, Ilmor supplied the 2175A engine to March F1 and Tyrrell. Tyrrell-Ilmor finished 6th in the Constructors' championship with 8 points while March-Ilmor finished 9th with 3 points. In 1993, Ilmor exclusively supplied the 2175A engine to power the Sauber C12 with the revised 2175B engine being introduced at the Italian Grand Prix. Sauber-Ilmor finished 6th in the Constructors' championship in 1993, scoring 12 points. Mercedes-Benz took a 25% stake in Ilmor in November 1993. Ilmor then made Mercedes engines for CART, IRL and Formula One. Mercedes-Benz's mission was clear - to dethrone Renault as the leading Formula One engine. In 1994, Ilmor designed a new Mercedes-Benz Formula One V10 engine to power the Sauber C13. The Sauber-Mercedes team finished 8th in the Constructors' championship in 1994, again scoring 12 points. On the 28th of October, Mercedes-Benz and McLaren announce their new Formula One partnership. 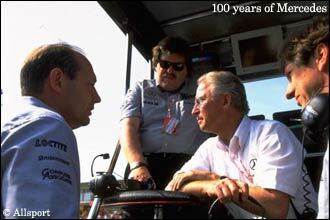 This partnership had been forged by Mercedes Motorsport manager, Norbert Haug, and McLaren's team principal, Ron Dennis. It was becoming clear to Mercedes that Sauber did not have the resources necessary to win in Formula One. Ron Dennis was disillusioned with his current engine supplier, Peugeot, because of the disturbing number of engine failures during the 1994 season. The 3 Litre Mercedes-Benz FO110 V10 engine was a completely new engine that was designed to be lighter than the Renault V10, thus allowing better weight distribution. The FO110 V10 engine powered the McLaren MP4/10 for the 1995 season. With Nigel Mansell and Mika Hakkinen as drivers, McLaren were confident of a change of fortune. Unfortunately, the MP4/10 was a pig and Nigel Mansell walked out after 2 races, concluding that McLaren was incapable of solving the problems that stood in the way of success. The MP4/10B and MP4/10C chassis were not significantly better. McLaren-Mercedes finished a distant 4th in the 1995 Constructors' championship with 30 points and 2 podium finishes. This grim season ended with Hakkinen receiving serious injuries during qualification for the Australian Grand Prix at Adelaide. In 1996, the driveability and power of the FO110 V10 engine was improved. This engine was coupled to the McLaren MP4/11. Hakkinen bravely returned and was partnered by ex-Williams driver David Coulthard. This was another difficult season for McLaren-Mercedes, again finishing 4th in the Constructors' championship with 49 points and six podium finishes, with their highest finish being 2nd. In 1997, the new FO110E V10 engine was coupled to the McLaren MP4/12 and David Coulthard opened the Grand Prix season with a victory in Melbourne, Australia, giving Ilmor-Mercedes their first win and ending McLaren's three season drought of Formula One victories. Coulthard brought Ilmor-Mercedes their second victory at Monza, Italy, while Hakkinen won the European Grand Prix at Jerez, which turned out to be one of the strangest and most controversial races in Formula One history. surely at the Luxembourg Grand Prix, where Hakkinen's and Coulthard's engines both failed, within a lap of each other, while lying 1st and 2nd, in front of DaimlerChrysler's senior management, who were seated in the Nurburgring's Grandstands. McLaren-Mercedes finished a close 4th in the 1997 Constructors' championship with 63 points. At the same time, Renault Sports announced that they were withdrawing from Formula One at the end of the 1997 season and that Renault-designed engines would continue to be manufactured by Mecachrome. Hence, the door was now open for Ilmor-Mercedes to lead Formula One. In 1998, Ilmor produced the Mercedes-Benz FO110G V10, which was fitted in the Adrian Newey-designed McLaren MP4/13 shod with Bridgestone tyres. The FO110G V10 was about five percent lighter than the previous FO110F V10. At the season-opening race at Melbourne, the McLaren-Mercedes team demolished the opposition, lapping everyone including the once all-conquering Williams-Renault. Mika Hakkinen won the 1998 Drivers' Championships for McLaren-Mercedes. The FO110G V10 would become Ilmor's most successful Formula One engine, winning the Formula One Constructors' championship with 9 Grands Prix wins, 5 one-two finishes and 156 points. In 1999, Ilmor produced the FO110H V10 which was coupled to the McLaren MP4/14. Ilmor-Mercedes faced a greater challenge since Ferrari were closing the performance gap with their 048 engine. Jordan-Mugen Honda also picked off 2 victories and Stewart-Ford were also in the hunt with their new-generation Cosworth CR1 engine. Mika Hakkinen narrowly won the Drivers' championship for the second year in a row, but McLaren-Mercedes had to settle for second in the Constructors' championship with 124 points and 7 Grand Prix wins. In 2000, Ilmor introduced the Mercedes-Benz FO110J V10 which was coupled to the McLaren MP4/15. Ferrari had caught up with Ilmor-Mercedes with their 049 and 049B engines. Ilmor and Ferrari engines totally dominated the 2000 season with no other manufacturer coming close to victory. Mercedes announced that they are withdrawing from CART at the end of the 2000 season. Chastened by their failures in 1999 and 2000 seasons, Ilmor-Mercedes have redoubled their efforts to regain the upper hand in Formula One. The FO110K V10 engine was ready early for the 2001 Grand Prix season.